It’s called a cake but I think it’s more like a souped up banana bread. It’s moist, it’s crunchy and it’s got lots of delicious banananess. Ok, so that’s not a word but it sounds good, huh? 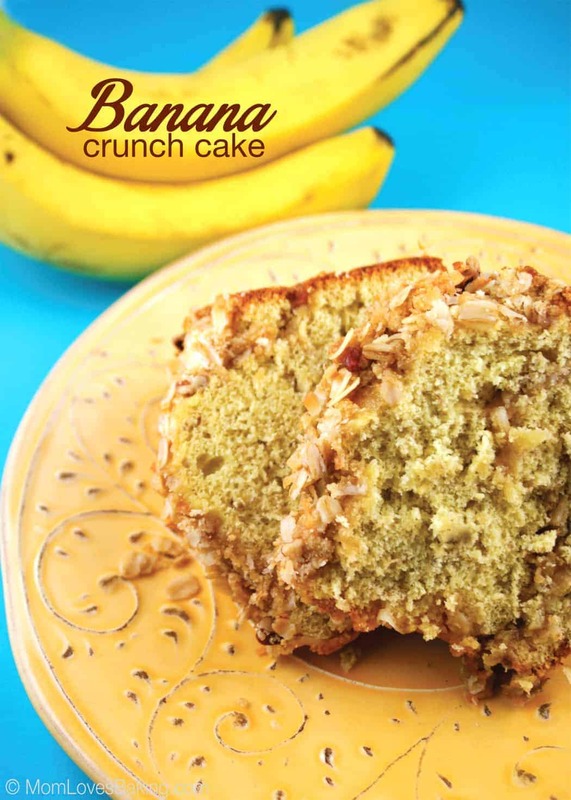 Banana Crunch Cake was 1 of 2 winners at the 1973 Pillsbury Bake-Off. Recipe on Pillsbury.com by Bonnie Brooks of Salisbury, Maryland. 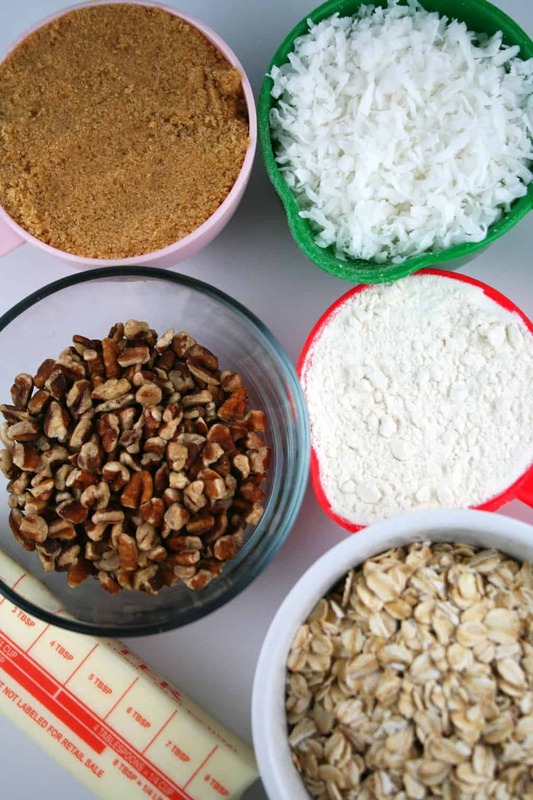 These are the ingredients you will need for the lovely crunch topping. Scroll to bottom of this post for exact measurements. I used a pastry blender to mix everything together. 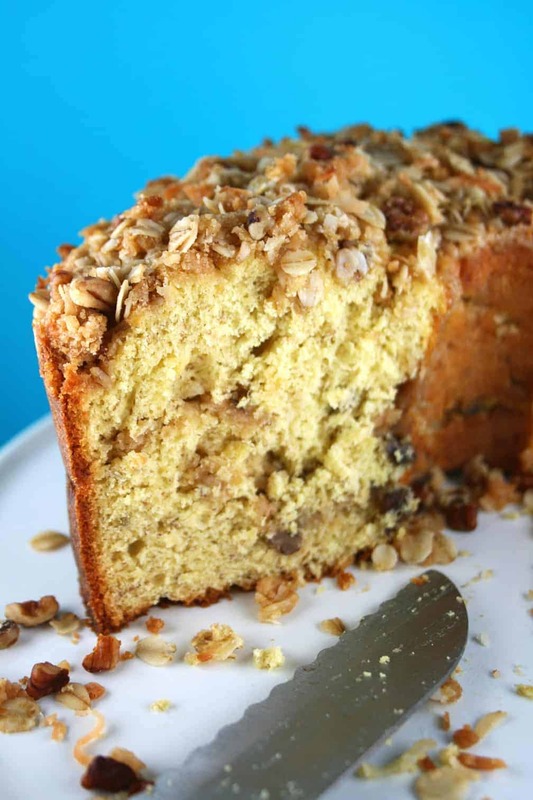 You should have a streusel like topping and that’s what provides the crunchy topping for this cake. Next you make the batter. 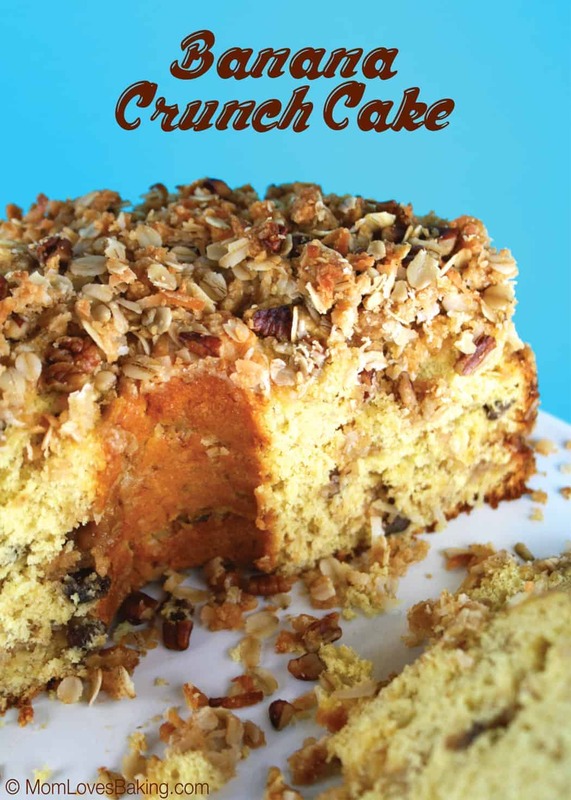 The recipe uses a cake mix as the base which makes it quick and easy to whip up. You line the pan with alternate layers of cake batter and crunch topping by dividing each in thirds, finishing with crunchy topping on top. Here it is ready to go in the oven. Slice it up and enjoy! You can see the crunch topping going through the middle of the cake which gives it a nice texture. Stay tuned for the next baking project recipe, #27 Chocolate Cherry Bars, which is one of my favorites so far. Heat oven to 350°F. Grease and flour 10-inch tube pan. Lightly spoon flour into measuring cup; level off. 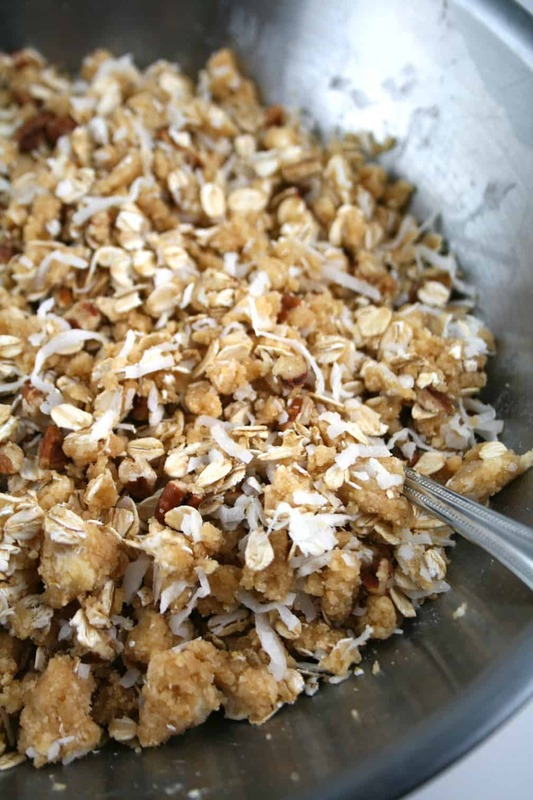 In medium bowl, combine flour, coconut, rolled oats, brown sugar and pecans; mix well. 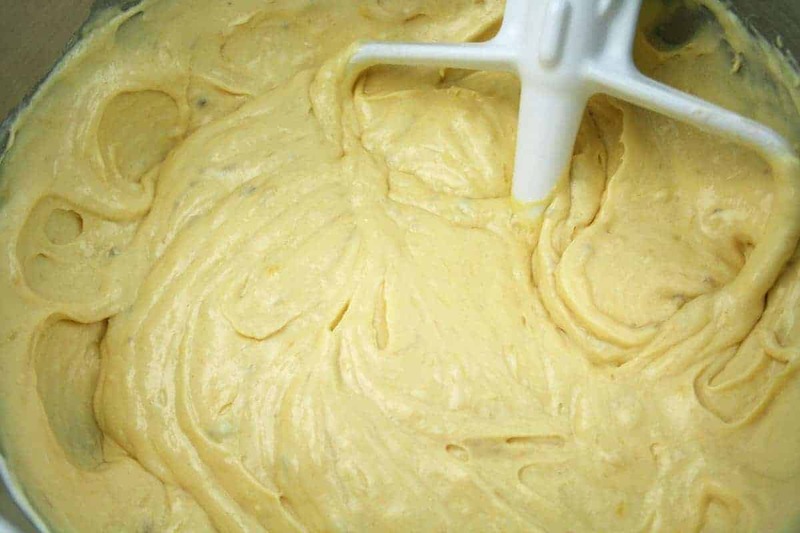 With fork or pastry blender, cut in margarine until mixture is crumbly. Set aside. In large bowl, combine bananas, sour cream and eggs; beat at low speed until smooth. Add cake mix; beat 2 minutes at high speed. 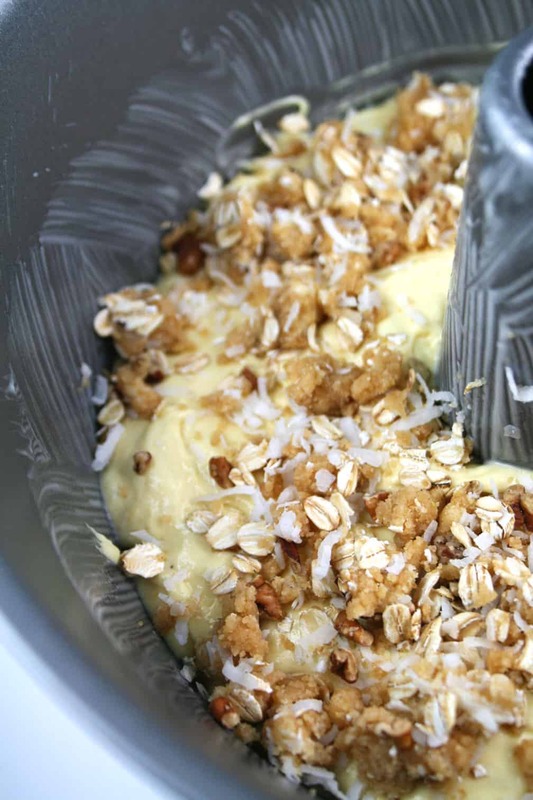 Spread 1/3 of batter in greased and floured pan; sprinkle with 1/3 of coconut mixture. 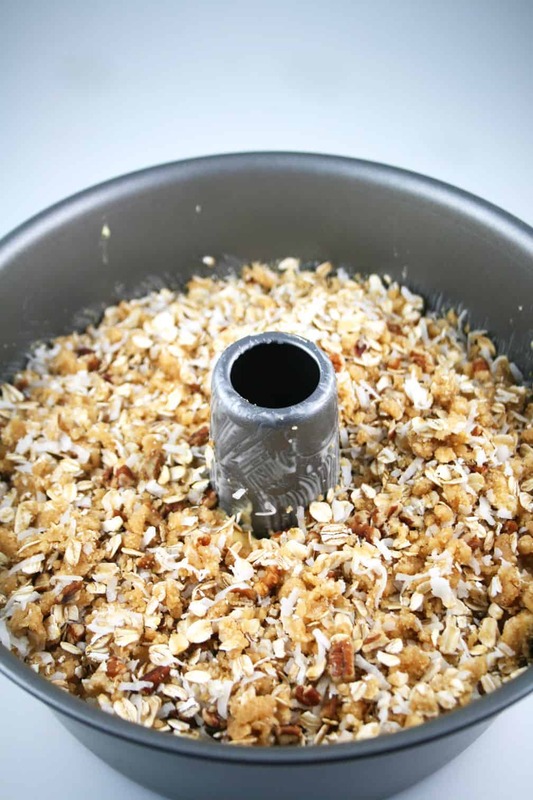 Repeat layers 2 more times using remaining batter and coconut mixture, ending with coconut mixture. Bake at 350°F. for 50 to 60 minutes or until toothpick inserted near center comes out clean. Cool upright in pan 15 minutes. Remove cake from pan; place on serving plate, coconut side up. Cool 1 hour or until completely cooled.